taxize was seven years old this last Saturday! taxize is designed around making working with taxonomic names easier - abstracting away the details of what each of 20 or so taxonomic data sources require for a given use case. We’ve come a long way since May 2011. We’ve added a lot of new functionality and many new contributors. Eduard Szöcs and I wrote a paper describing taxize back in 2013, published in F1000Research. The paper has probably made taxize users more likely to cite the package, though we have no direct proof of that. 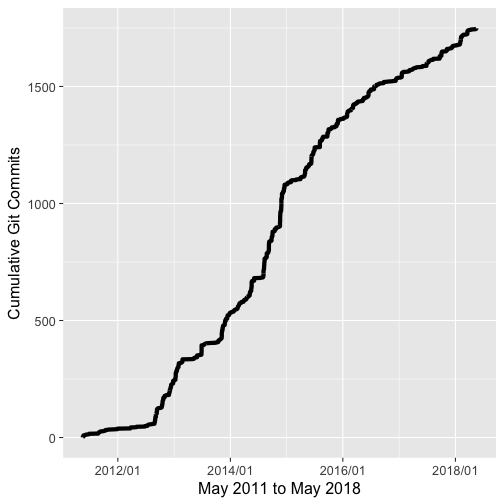 The paper above and/or the package have been cited 69 times over the past 7 years. 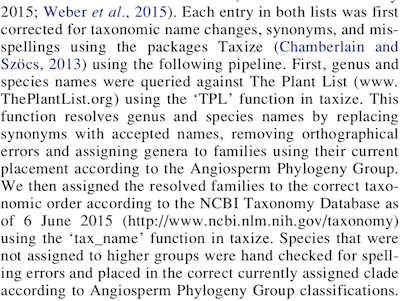 The way taxize is used in research is often in “cleaning” taxonomic names in one way or another. In addition, many users use taxize to get taxonomic names for certain groups of interest. Integration with taxa package (maintained by one of our rOpenSci fellows Zachary Foster) in all get_*() functions. This will make the outputs of all get_*() more consistent and easier to integrate into your downstream workflows. not taxize per se, but taxizedb is starting to really take shape due to help from Zebulun Arendsee. taxizedb will make taxonomic name work much faster for large datasets. It’s worth checking out. A huge thanks goes to all taxize users and contributors. It’s awesome to see how useful taxize has been through the years, and we look forward to making it even better moving forward.